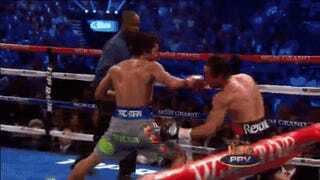 The fourth iteration of Pacquiao-Márquez did not disappoint, coming to the end at 2:59 of the sixth round when Juan Manuel Márquez connected flush with Pac-Man's face and dropped him to the mat, winning by TKO. It's the first time since 1999 Manny Pacquiao has been knocked out, and the first "official" win for Márquez in a series of fights the Mexican boxer's fans have long believed to have unjust outcomes. Márquez dropped Pacquiao earlier in the bout with a massive right hand, but a strong rally from the Filipino champ bloodied Márquez's nose and mouth, leading observers to wonder if he'd be able to continue. Before that decision had to come, he counterpunched Manny to the TKO.